arm warmers, minimalist footwear, the paleo diet, ice baths…the running community is quick to embrace the next! big! thing! that is espoused in the media as the must-do/must-have item to improve! your! running! you’re probably familiar with the concept of compression socks from seeing old people wearing the hideous flesh-coloured ones on airplanes. well, believe it or not, the running versions follow the same type of design, and provide similar benefits to the medical socks (improved circulation, for example) – they just look more fun! ...and a close up of the brands (i forgot our house brand - oops!). 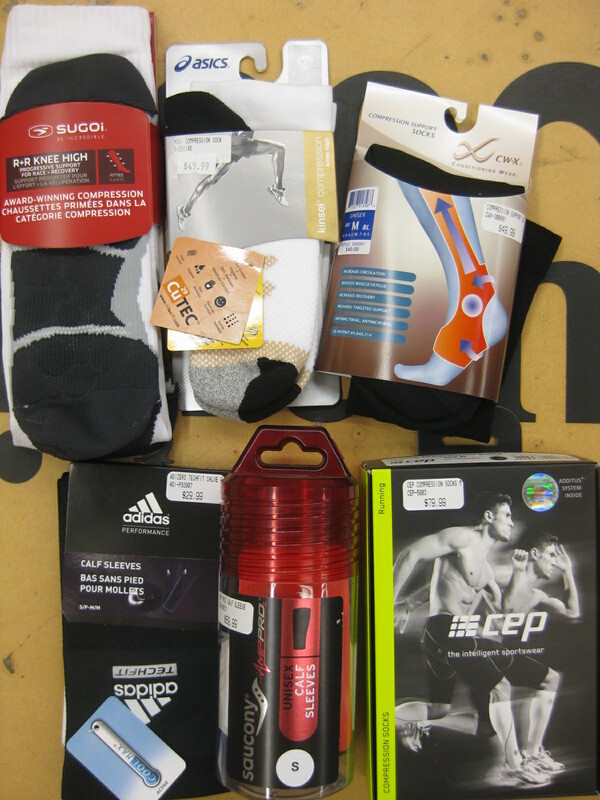 as you can see in that photoS (^^), we carry a few different brands of compression socks at the store, ranging in price from $25.99 to $79.99. 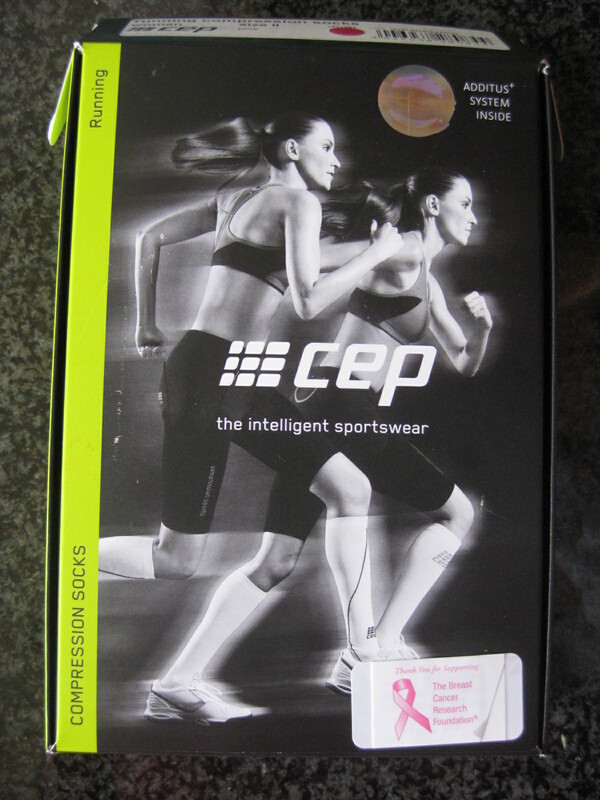 mine are the CEP brand (yup, the $79.99 ones!). just click on the link, there, to read all about the socks. [i am not going to go into great descriptive detail, here – i don’t know about you, but whenever i see product info on other blogs, i just skip over those paragraphs. it’s much more interesting to read personal accounts!]. details: an eleven hour work day, hours split between the storeS. a warm day! let's show these babies off! i chose muted shoes so as not to distract from the socks! i gave myself an extra 5 minutes to get dressed – good call! the socks were quite the challenge to pull on because they are so tight (which is how they are supposed to fit). i also put one on way crooked and had to complete a do-over. the socks are super comfortable! i can tell i am wearing them, but they just feel supportive, not constrictive. i most notice the feel of the fabric on my calves. the test: after many hours on my feet, my left ankle has a tendency to get a little puffy; i was interested to see whether the socks would make a difference. when i pulled the socks off at night…yes! my left ankle was completely normal! i am impressed. conclusion after day one: i’m a fan (both of the feel and of the look – rockin’ the retro 70’s style!). i would wear these all day, every day, no hesitation (however, i do not think i could sleep in them because they are just noticeable enough that i don’t think i could fall asleep with them on). details: a morning run; errands completed on foot in uptown; a shorter late aft/evening shift at the store. i pair the socks with my (canary feet) adidas adistar boston 2's for the run...if nothing else, this get-up will help me be more visible to traffic! off to do my errands; no daffodils were harmed in the snapping of this photo! let's match our shoes to our socks, today! during my run: awesome! like yesterday, i can notice i have socks on up to my knees, but it’s a good, supportive feeling, not annoying. i pretend i am an elite – wheeee! 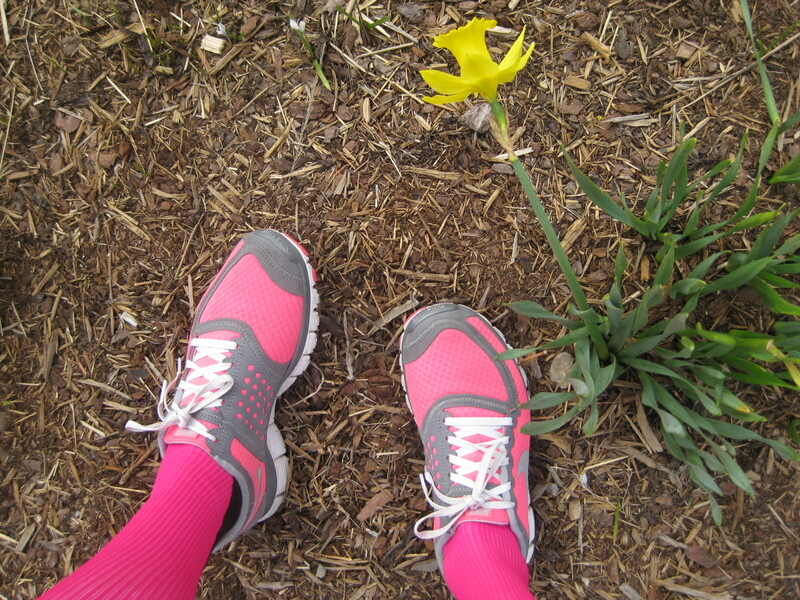 did the socks quicken post-run recovery? i honestly couldn’t tell ya. i pretty much don’t notice the socks during the day and evening. i like that the fabric is not itchy. i laugh because i feel like i am back in grade school when i wore knee socks practically every day! see?! 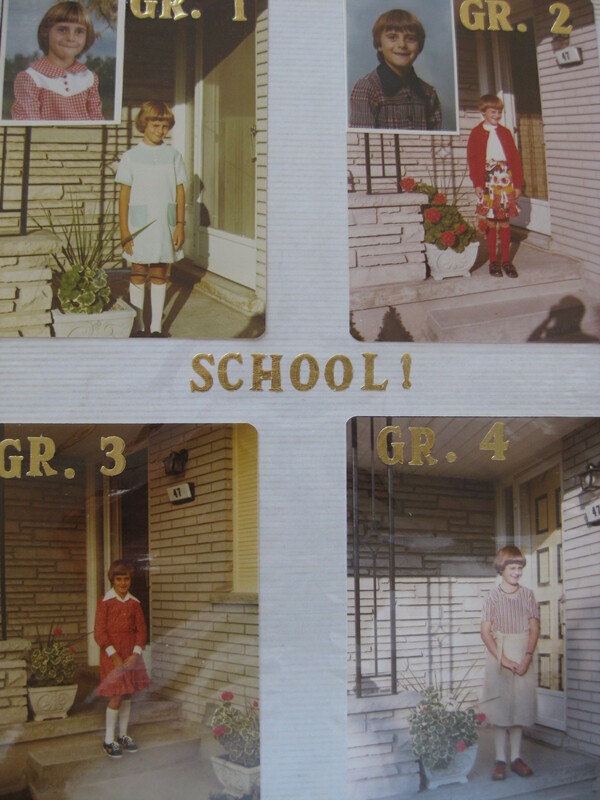 these are my "first day of school" photos for grades 1-4 - note the knee socks in EVERY SINGLE PICTURE! details: aunti day in toronto! the socks visit the playground with little e! today was about 9 degrees; i wonder if the socks feel too hot when it’s july temps?? i bet the placebo effect is a factor for those who choose to wear compression socks. i would love another pair of CEP socks (ok, i’ll take every colour available, thanks) and i’d also like to try another brand. i would not purchase these socks if i had to pay the regular retail price of $79.99. they are very enjoyable…but so are my $9.99 nike socks. i just cannot fathom paying over $80 (with tax) for socks. 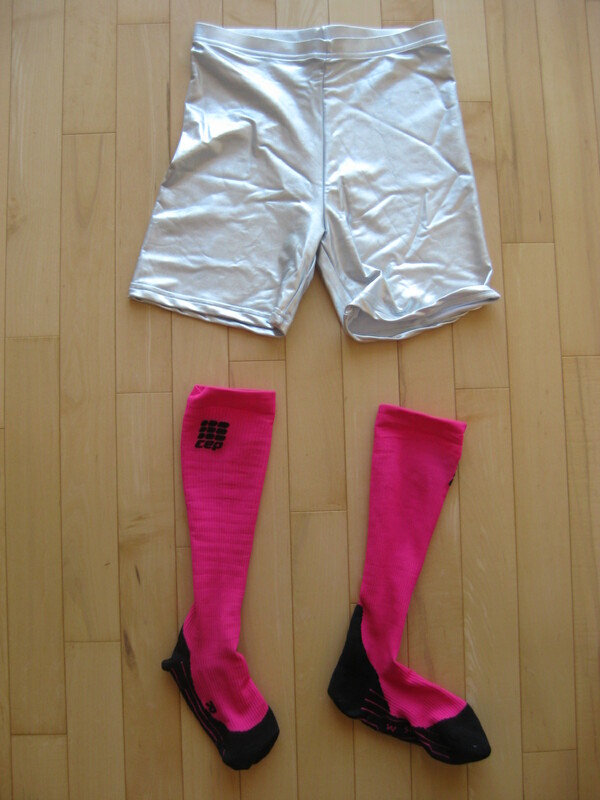 ...to pair the socks with my silver lame shorts?! now all the socks need is to be tested in a race! wait…oh, yea! they’re going to get that opportunity….tonight! disclaimer: i purchased my CEP socks with my very own money, although i did receive them at a nicely discounted price, thanks to an employee purchase program through the store. CEP did not ask me to review these socks, i am not being compensated for sharing my impressions, and all thoughts expressed in today’s blog post are my very own. [haha! i love when i can insert a clause like this to a blog post – it makes me feel like a professional blogger!]. 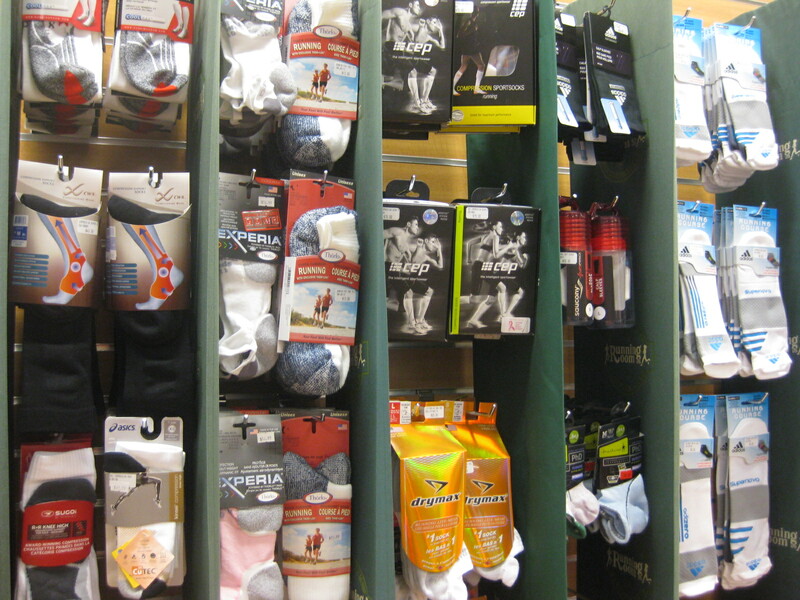 would you be willing to try compression socks, either for sport or for travel? i will wear these on my next plane flight! 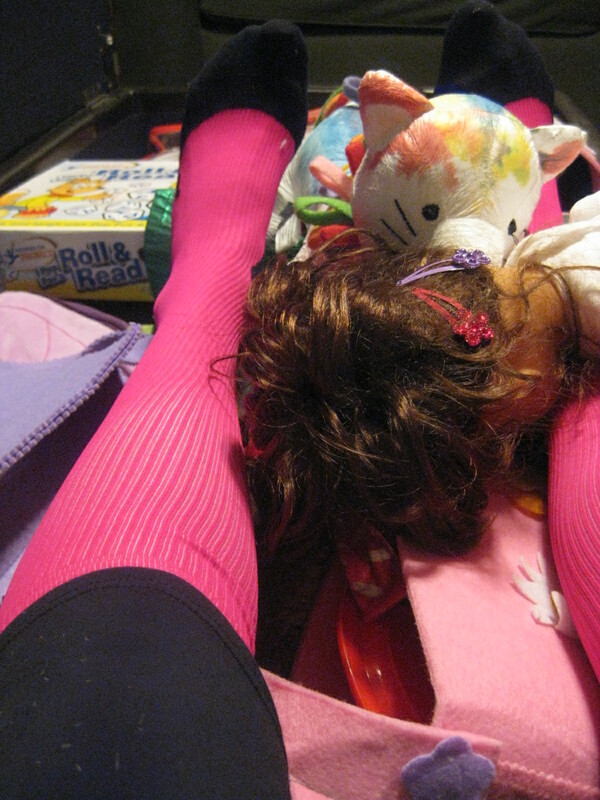 what’s the most you would be willing to pay for compression socks? they may be a christmas list item for many people! Question: are they one size fits all? or do they come in different sizes. I have thin legs but muscular calfs. 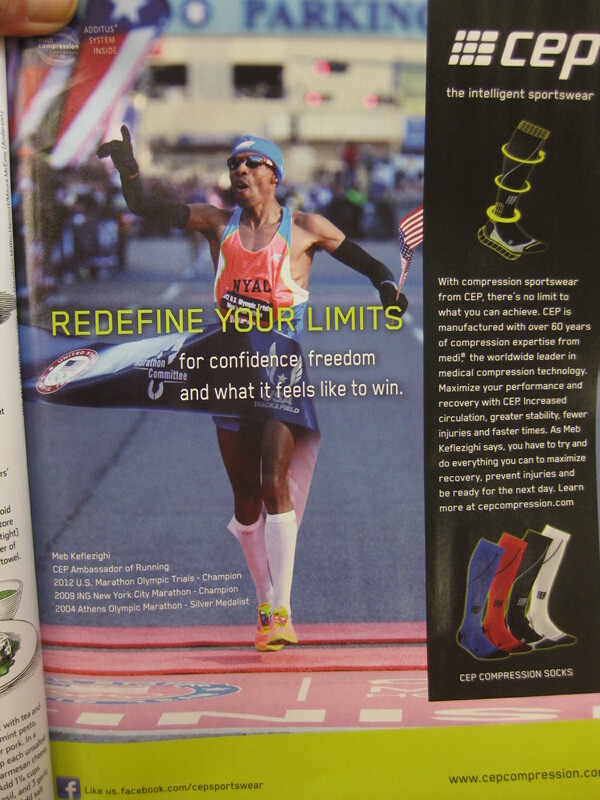 The most I’ve ever paid for a pair of socks was $12 and that was several years ago at a running expo before a race. The pink color of your CEPS is the same color as my Asics shoestrings. the socks are sized: II, III, IV for women (mine are II). you measure your calf to determine the right size for you. you NEED these socks to match your shoelaces!! $12?! you are a good bargain hunter, johanna!! yes, i can see you in the pink, dorry! they need to make a purple pair! 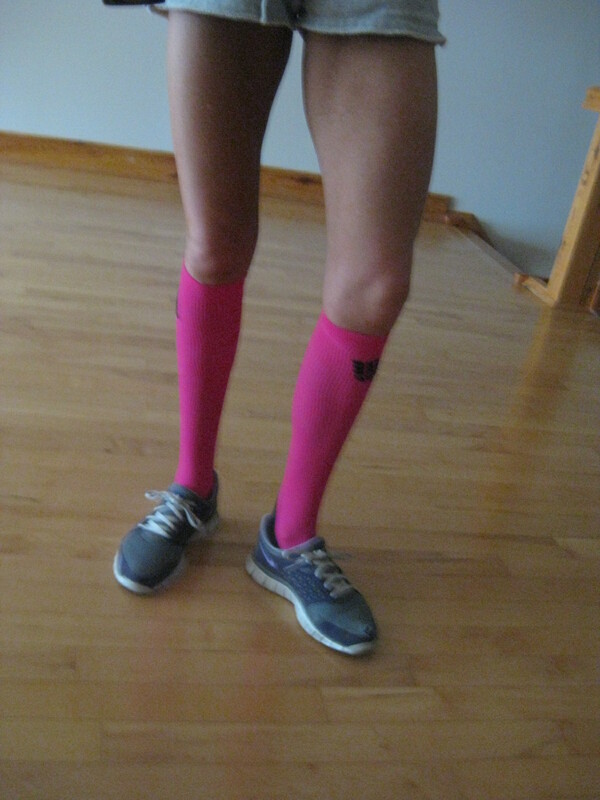 the arm sleeves i have i got at lululemon….not sure if they do compression socks?? i bet they’d be great sellers, and i can just see lululemon doing something fabulous with colour/design! totally awesome socks! And I am at an age when I would wear bright pink socks just to make people wonder what I am up to! yea! i love your attitude, ele!! i admire your spirit! i bet you already have some bright articles of clothing in your wardrobe??! you’d walk faster and further in these socks, i just know it – haha! Not sure- I had to put them on my mother too many times- what a challenge. But I suppose if I get tired enough legs as I age, I would. New colors are much bettter! oh my, i cannot imagine the challenge of getting compression socks onto someone else! i can hardly get them on my own legs! the bright colours do add to the fun factor! i hope you consider them! thanks, fran! now, you can get them in white or black which is a little less “flash…” – and you would find them super comfy for walking! and you can always cover them up with long pants! OK, but wait…80 dollar socks are a real thing? The mind, it is blown. I understand they’re a technical running sock, but I still have a hard time believing people have that much money. They should give some of their money to me if they’re so anxious to get rid of it. They are REALLY cute though. Love them paired with the pink shoes…and I think you would really rock them with the lame shorts. And don’t forget your aviators and your feather earrings. I laughed at your “professional blogger” disclaimer. Except that if you were a professional blogger, you’d never buy your own socks; you’d review anything – even some things you never actually tried; you’d write a long blog post about a free 1.99$ yogourt; and then you’d do a giveaway of a coupon for the same yogourt, and all people would have to do to enter is comment 3 times, tweet 6 times, follow your blog and your facebook and your twitter and your google plus, write a letter to the local newspaper, wear a sandwich board and offer you their first-born child. By the way…I followed your advice and deleted all of the unread posts in my reader. FREEDOM! ok, i accept your outfit challenge – it will happen some time this summer and i will have photographic proof up on the blog to prove it. 😀 love your discourse on the hypothetical giveaway because it sounds ridiculous, but not far off the reality! i am glad we can have a chuckle! yes, seriously $80…and we sell a lot of them! so glad you hit the delete button. well done, my friend! I guess I don’t have a reason for them… but they look great and fun! lol. As I was reading this, I yelled into the other room to ask Joe what his opinion of compression socks is. He said he loves them and he’d wear them for every run if he could (he has one pair of Sauconys that he got on sale for about $26). He then went on to talk about all the pro runners who wear them, and he said, they must wear them for a reason—chalane flanagan and kara goucher (I totally just spelled that first name phonetically–I’ve never heard of her. lol). He also said players in the NBA were wearing them (someone named Dwayne Wade), and then they got banned (unfair advantage? Not sure on that one). Joe’s closing statement on the convo was, “I love ’em. I want another pair. I’m gonna wear them today!” lol. And that’s all I can add here! Happy Sunday! thanks for relaying joe’s comments, lisa! i very much enjoyed reading his opinion! have to agree – if the pros all do it, there has to be a sound logic behind using them! i did not know they were banned in the nba?! saucony is a reputable brand, too – and $26 was a very fair price to pay! now you know what to get joe for a belated bday gift?! haha! Does that mean I’ll see you tonight in Elmira? see you tonight, ali! yes! 🙂 glad you had success with the compressions socks helping your ankle! the bright colour definitely adds to the fun factor! I’ve never really thought about using compression socks…I guess I see them as being for *serious* runners, which I don’t identify myself as…and aside from tiredness after a longer run, don’t really have problems with my legs (so far…the place where I sometimes have issues is my right hip…). Love the looks you made with the socks! oh, i beg to differ, zo! you have proven to be very dedicated to your running, and your mileage is progressing! you ARE a runner!!! they’d be good to wear next time you fly to england, too! aw super cute school pics! I’d be willing to try these socks as i’ve seen them written about quite a bit lately but not for that price tag! £10 might be my limit. Would you recommend them for short distance runners – i’m only doing about 5K each day at the mo? thanks for your comment, dawn! 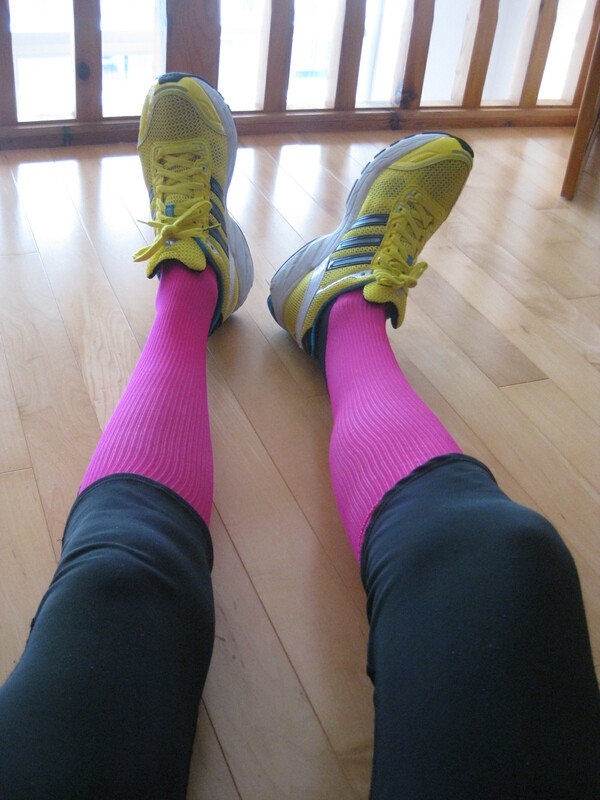 there certainly would be no harm in wearing compression socks for a 5k distance. i think they become more of a *necessity* as you head into longer distances (say, 1/2 marathon and more). maybe you will find some at a reasonable price that you can try!